^ "Gemmill: McFadden's wonder strike tops my glory goal"
^ "McFadden goal to be commemorated"
^ "Ferguson and McFadden take awards"
^ "Falkirk miss out on top flight"
^ "McFadden signs for Everton"
^ "From Fad to immortal fame"
^ "McFadden to miss out for Scotland"
^ "McFadden winner dedicated to Phil O'Donnell"
^ "McLeish won't rush McFadden"
^ a b "Birmingham City latest: James McFadden holds contract talks as Phillips, Bowyer and Parnaby leave"
^ "Birmingham City: What has happened to the Carling Cup winning team?" ^ "Aston Villa's Alex McLeish rules out transfer deal for ex-Birmingham City striker"
^ "Wolves boss Mick McCarthy keen to sign James McFadden"
^ "Moyes fears missing out on Celtic target McFadden"
^ "Everton re-sign striker James McFadden"
^ "Everton striker James McFadden admits fears for career"
^ "James McFadden unlikely to sign after Motherwell training spell"
^ "James McFadden awaits offer to quicken the pulse"
^ "Motherwell to approach James McFadden about return"
^ "James McFadden will not sign for Motherwell - Stuart McCall"
^ "Sunderland take James McFadden on trial as Craig Gordon is linked with Southampton move"
^ "James McFadden close to agreeing Sunderland deal"
^ "Late charge not enough for Sunderland"
^ "McFadden returns to Motherwell until the end of the season"
^ "Motherwell netted four second half goals as they crushed Hibs at Fir Park"
^ "SPL: Motherwell draw 2-2 with St Mirren after James McFadden's late equaliser"
^ "SPL: Billy McKay hat-trick for Inverness in 4-3 win over Motherwell"
^ "Motherwell: Paul Lawson signs from Ross County as seven exit"
^ "Motherwell: Stuart McCall closes in on James McFadden deal"
^ "James McFadden links up with Motherwell while Michael Higdon heads for Holland"
^ "Friendly: Newcastle score comfortable 4-2 win over Motherwell at Fir Park"
^ "Transfer news: James McFadden poised to sign Motherwell deal"
^ "James McFadden signs one-year deal at Motherwell"
^ "James McFadden turned down better offers for home comforts at Motherwell"
^ "Motherwell: Stuart McCall frustrated by Celtic goalkeeper"
^ "Motherwell boss Stuart McCall backs playmaker James McFadden to bounce back from form slump"
^ "Motherwell 4 St Johnstone 0: Four-goal haul opens a fourth year in charge for Stuart McCall"
^ "Motherwell star James McFadden: It's a case of small steps but I'm slowly getting back to my best"
^ "Motherwell 2 Ross County 1: Steelmen keep pace with Aberdeen in the race for second spot"
^ "Transfer News: James McFadden ready to talk about extending Motherwell contract"
^ "Transfer news: Motherwell confirm that James McFadden is to leave the club"
^ "Record FC St Johnstone: James McFadden could be the perfect tonic as we warm up for our battle of the Saints"
^ "Scottish Premiership: St Mirren beat St Johnstone with a late goal"
^ a b "St Johnstone sign striker Graham Cummins as McFadden leaves"
^ a b "McFadden says sorry"
^ "McFadden kills off Faroes"
^ "Ten-man Scots win in Iceland"
^ "McFadden finally scores the goal!" 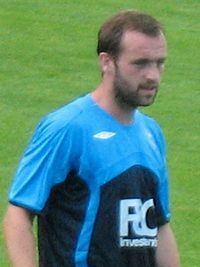 ^ "Interview: James McFadden, Scotland and Everton striker"
^ "Gordon Strachan: There is still room for Faddy and Kris"